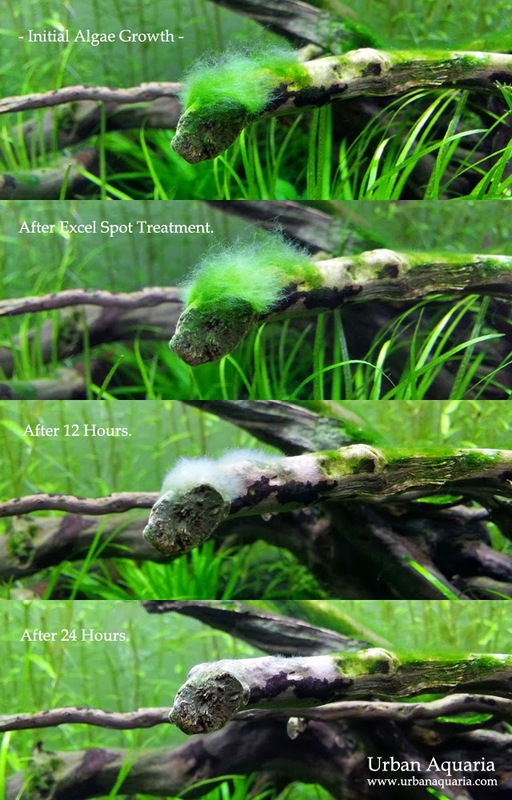 So far, i've been allowing a thin layer of green fuzzy algae to grow on parts of the twisty wood, but on closer observation, i've noticed that there are actually many other types of algae growing and competing with each other for space on the wood too. In one particular spot, the algae has a noticeably different growth (probably a different algae species), it is more filamentous and seems to be growing much larger and faster. I felt that it detracted from the overall look, so it was a good opportunity to document my method to remove it. This algae was really tough to remove by hand and it was securely attached to the wood, and i can't remove the entire wood structure to scrub it off easily (i wasn't keen to kick up the substrate and create a huge mess)... so i decided to do a spot treatment on it using Seachem Excel. I used a syringe with a long applicator needle and 2ml of Seachem Excel (non-diluted), switched off the canister filter, then injected the solution directly onto the bunch of algae. I let it settle into the algae for a few minutes, then switched the canister filter back on to resume flow in the tank.